Nitrilosides are a group of plant substances some people refer to as vitamin B17, although these chemicals technically are not vitamins. Amygdalin is a type of nitriloside from which Laetrile is derived. Laetrile is a claimed cancer treatment, and it may be natural or semi-synthetic, depending on its place of manufacture. The Memorial Sloan-Kettering Cancer Center (MSKCC) advises against taking Laetrile or amygdalin supplements because no evidence supports their effectiveness, and they are associated with cyanide toxicity. Anyone who does take these products should avoid eating foods containing amygdalin, because these foods can add extra cyanide to the body. The foods are safe otherwise because the levels of amygdalin in them are low, according to Cancer Research UK. 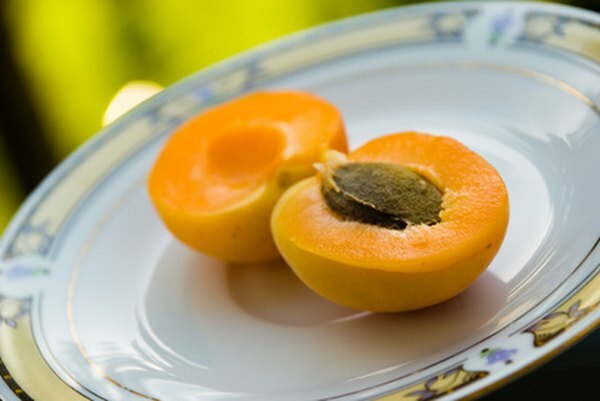 The primary source of amygdalin is apricot kernels, contained inside the seeds (pits). The health claim for preventing cancer involves eating about seven apricot kernels per day, as explained by CureZone. The cancer treatment Laetrile, when made from natural sources, is derived from crushed apricot kernels. Cancer Research UK notes that eating 50 to 60 apricot kernels per day is toxic enough to be fatal. Other fruit seeds containing amygdalin include apple, cherry, nectarine, orange, peach, pear, plum, prune and squash. Bitter almonds taste like apricot kernels, and these ingredients can substitute for each other in recipes. Bitter almonds also contain amygdalin, and they have over 500 mg of nitrilosides per 100 g of food, according to Alternative Health Group. For this level of vitamin B17, people should eat the bitter almonds raw. Raw cashew nuts, macadamia nuts, pecans, walnuts and flax seed also contain amygdalin. Some vegetables, beans and grains also contain vitamin B17. Amygdalin-containing foods include various types of bean sprouts, carrots, celery, wheatgrass, yams, brown rice and pulses such as butter beans, lima beans and mung beans. Alternative Health Group lists foods with over 100 mg of nitrilosides per 100 g of food and varying amounts of amygdalin as buckwheat, cassava, millet, fava beans, lentils, and alfalfa and eucalyptus leaves. Berries and certain other fruits also contain vitamin B17, according to Alternative Health Group. These fruits contain varying amounts of amygdalin, and they all contain over 100 mg per of nitrilosides per 100 g of food. They include wild blackberries (domestic ones contain only small amounts of nitrilosides), boysenberries, Swedish cranberries, currants, elderberries, gooseberries, huckleberries, loganberries, mulberries, raspberries, quince, choke cherries and wild crab apples.